I’m beyond excited that Flax Art & Design, the fabulous art store in San Francisco, is having me put on a free workshop demonstrating my favorite products, Transfer Artist Paper (TAP) and Lutradur! I’ve told you about both products in many blog posts (see my list below). TAP is my go-to heat transfer paper, the best I’ve ever used. TAP allows you to easily transfer crisp, colorfast and washable images to almost any surface with your household iron. You can inkjet print, paint, stamp, or draw images onto TAP for a variety of amazing effects. Lutradur, which I’ve also written extensively about, is a spun-bonded polyester that combines the best qualities of fabric and paper. It’s a fantastic medium for mixed media as well as for artists looking to add a new level of texture to their work. I’m a demonstrator and teacher for C&T Publishing,makers of TAP and Lutradur. In this free 2-hour lecture/demo at Flax, I’ll show you the entire process – from creating an image on TAP to successfully transferring it to Lutradur. I’ll bring a wide variety of samples to show you the endless potential that these two products make possible, and to spark your creativity and imagination. The free workshop is March 15th, from 1 to 3 pm. Space is limited, so sign up today to reserve your spot! Call Flax Art & Design at 415.552.2355, or click here to sign up online. 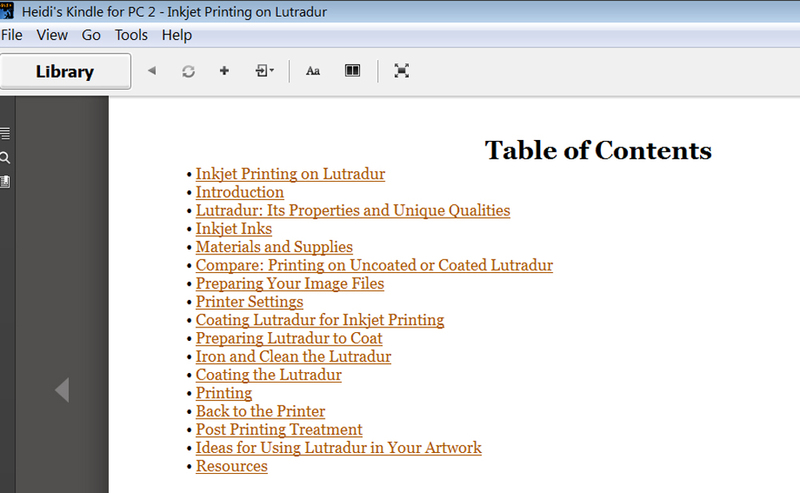 Check out my book: Inkjet Printing on Lutradur. 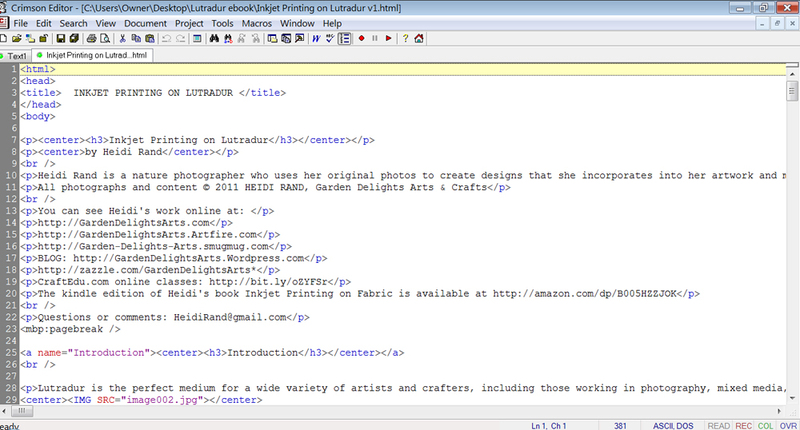 CraftArtEdu class: Inkjet Printing on Lutradur. CraftArtEdu class about using TAP and other heat transfers onto wood. Learn to make personalized jewelry using your own images, designs, and artwork. We’ll explore several techniques to create unique earrings, necklaces, bracelets and pins from paper, fabric and lutradur that you print on your inkjet printer. Each person will work on at least one project at the workshop, and you will go home with many ideas and new things to try on your own printer. Making a personalized gift saves money and shows that you care to take the time to create something special for friends and loved ones, as well as for yourself! Using your photos and scanned memorabilia of your own life ensures that your gifts will be treasured and kept forever. The workshop will be held Saturday June 8, 2013, noon to 3:30 p.m. at The Village Shops and Galleries in El Cerrito (between Eureka and Stockton Ave.) Cost is $40 plus materials. For more information or to pre-register, please email me at heidirand@gmail.com. These days my creativity is best sparked by challenges organized by groups I’m in. I haven’t made an art hanging in a while, so when the call-out came to make a piece using some art material (I’ll let you know which when the challenge is over), I decided to use it in a mini-art quilt. 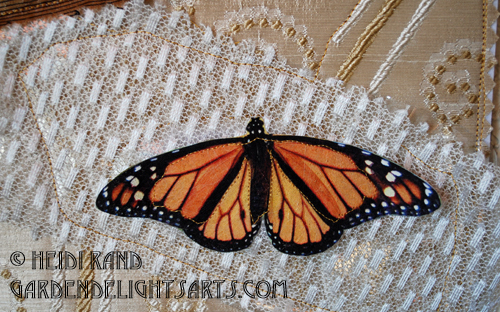 As it’s prime butterfly season, incorporating my favorite flying beauties into the piece was a gimme. I had the butterflies in my stash. They were photographs I took of an anise swallowtail and a monarch butterfly that we raised and released. I printed the photos onto lutradur that I treated with Golden Paint Digital Grounds. When I need to print something onto lutradur, I fill the entire sheet with images so as not to waste any of the treated material. 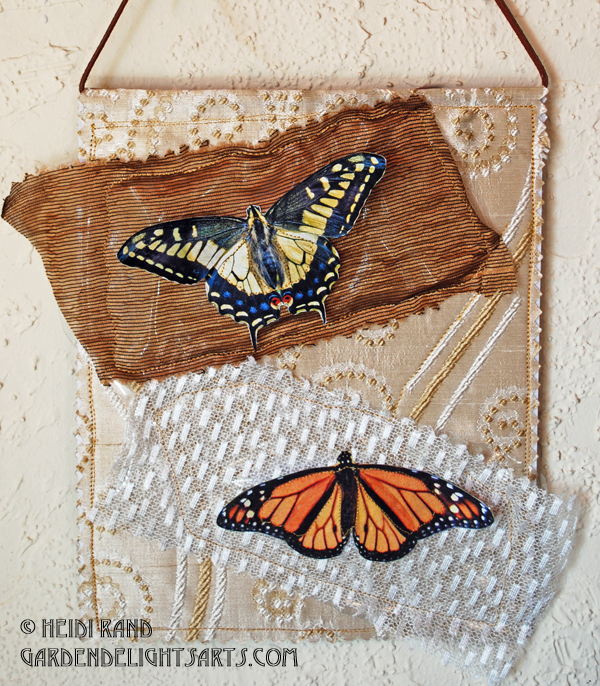 To set off the butterflies, I sewed them to some gauzy fabric bits that came in a flea-market home decor fabric sample book. For the background, I chose another larger piece from the sample book. I chose another piece from the sample book as a backing for a finished look, and slid a piece of firm stabilizer in between so it will hang without folding. I folded the top over and strung a leather cord through before I sewed it closed, for an easy hanger. 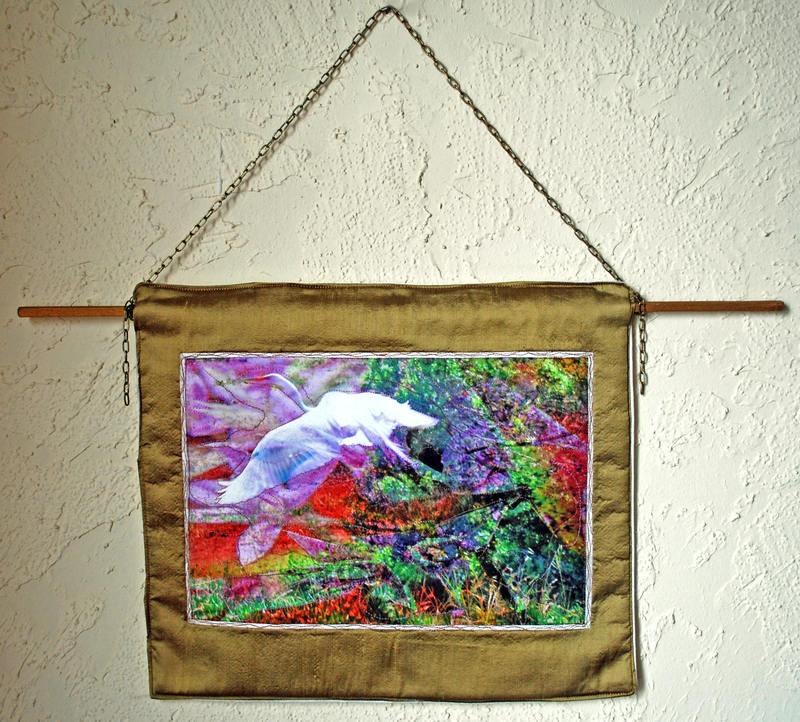 I love art quilts because they can be as simple or as complicated as you wish. If you don’t like to sew you can even just use double sided tape to add elements and make the seams. They’re a great use to upcycle discarded clothing or other fabrics. Have you made an art quilt? Post links here to any of yours that you’d like to show! When last we met I promised to let you know about my adventures in making my ebook into kindle-ready form. To cut to the end of the story … here it is! If you’re thinking of kindling yourself (no, that’s not a dirty suggestion), rather than paying someone to do it for you, the best place to start is Amazon’s own help pages. When you run into problems, you can also check with the related Community forum – lots of questions and answers, and you can post your own queries. My first obstacle – I don’t have Microsoft Word on my computer. My husband has it on his, but I have WordPerfect instead. One of the critical steps in kindle-izing a book requires saving the file as filtered html, which you can’t do in WordPerfect. Now, it’s not just that I’m lazy and didn’t want to walk upstairs to his computer. Switching to the other computer meant that I’d have to load some new programs onto his computer (and that makes him cranky), and that I’d have to transport my document and image files (not a big deal, but l was so exasperated that even that small task made me cranky). Anyway, I stubbornly decided to try the process without using Word. 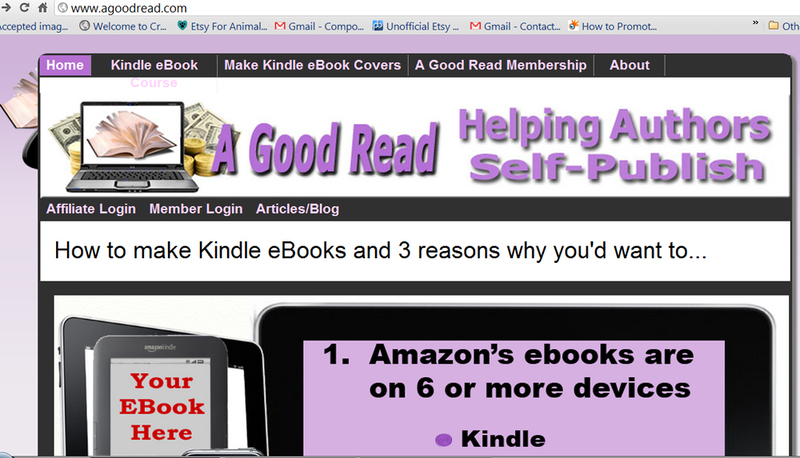 This decision at least led me to a great resource — Judith Tramayne’s videos and materials to help authors self publish books on the kindle and other ereaders. Judith has a series of comprehensive videos that seem very reasonably priced to me, and she offers a lot of her content free – including a series of macros that make it much easier to correctly format the html document that is the best way to get an ebook kindle-ready. I watched her free videos and downloaded the macros, and took her advice to install Crimsoneditor, a free source code editor. From the quality of her free videos, I think that paying for the series would be well worth it. I decided not to because I was so far along in the process that I only needed a bit of trouble-shooting to finish. But if you’re at the early end of the learning curve, it looks like a good option. Since my ebook was written in WordPerfect, I had to copy and paste it, paragraph by paragraph, into Crimsoneditor. Using Judith’s macros to add the correct html coding made the process much easier. 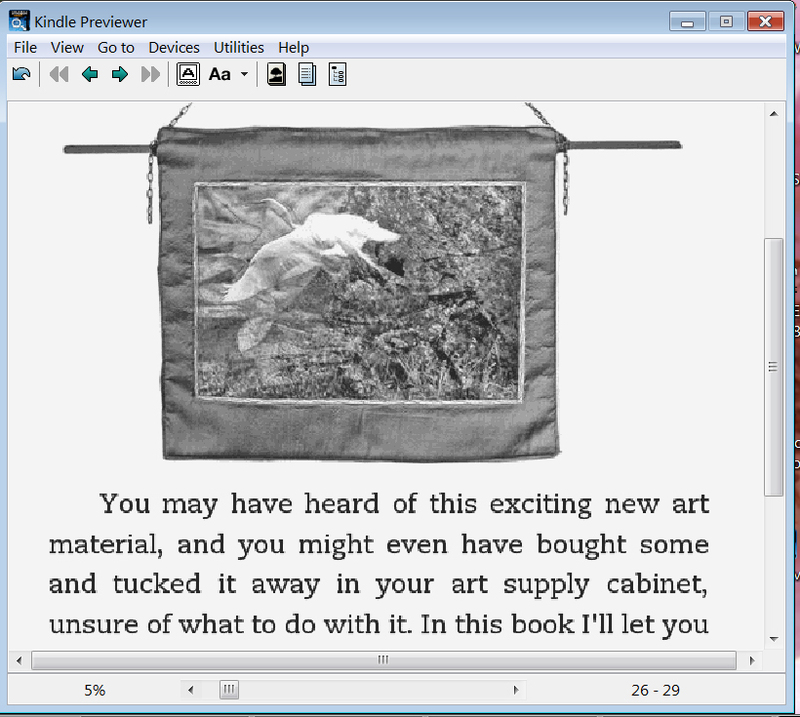 Images are another thing – the kindle is really designed for books without a lot of images. The basic kindle is only black and white, and you can’t really do much fancy with images. I found the html code to include images, and quickly resized all of my photos for the book in Photoshop Elements. Unfortunately, the images turned out to be my first big challenge. I took my nice neat html document made in Crimsoneditor and ran it through MobiPocket Creator to build the book. For a moment I thought all was well – I scrolled through the ebook in the kindle previewer that I had downloaded from Amazon. Chapter headings … check; text … check; and the images were all there!! Yes!! But then I got to the last page and found, to my dismay, that all 60 images in the book were also duplicated in a long long row at the end of the book. Yikes. I looked for some answers on the community forum but never found any satisfactory explanation, and certainly no cure. The duplicate images weren’t included in the html coding. Instead of spending a lot of time trying to figure out a fix, I decided to do what I should have done in the first place. I put the html document and image files onto a flash drive, trudged upstairs to my husband’s computer, and fired up Word. 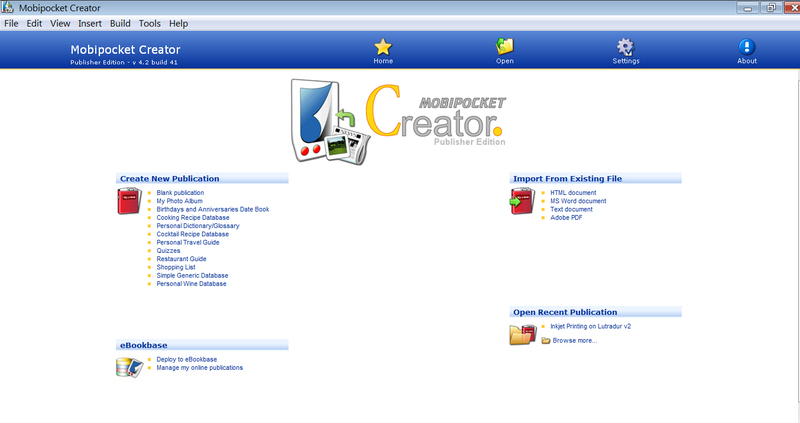 I saved the html document in Word as filtered HTML and ran it through MobiPocket. It worked! No trailing images. Now one thing that is puzzling — still more comfortable on my computer, I took the filtered HTML file to my computer and ran it through MobiPocket there – alas, I had the same duplicate images problem. (Insert sad face here)… So it actually could be that the problem was not caused by not using Word, but due to the fact that I’m saddled with Vista 64-bit on my computer (I know, I can’t stand it either). I read somewhere during my desperate search for help that Vista may cause problems with parts of the kindle-izing process. To wrap up this saga, there was some more wrestling with the Table of Contents, but suffice it to say that I finally followed the directions carefully and after pulling out some more hair I managed to generate a clickable TOC! It’s not pretty but I’m damned proud of it, so here it is .. Anyway, the bottom line – if you have Word, some familiarity with html coding, and a lot of patience and time, go for it and try to do it yourself. It’s very rewarding when it finally all comes together. Sunday October 24, 2010, noon to 3:30 p.m. Learn to create art quilts and other arts & crafts with this exciting new product that combines the best qualities of fabric and paper. Lutradur looks, feels and folds like translucent paper and doesn’t tear or fray. 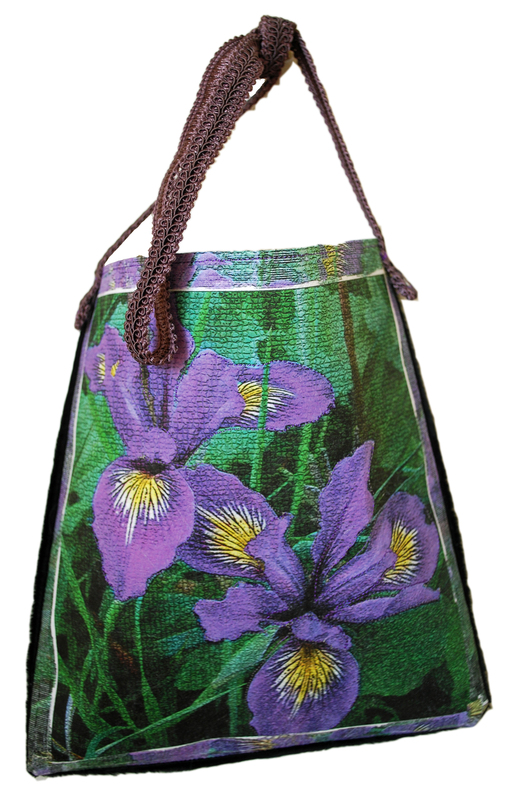 It’s the perfect medium for a wide variety of sewing, mixed media art and crafting. 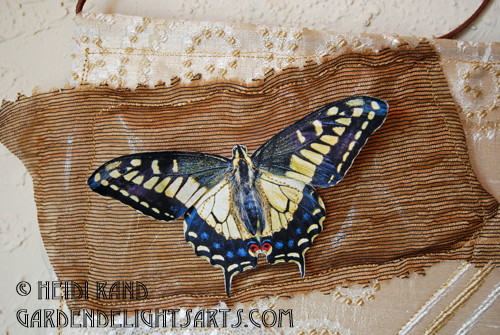 I will give an overview and demonstrate many ways to use lutradur: sewing, inkjet prints, transfers, heat gun, soldering iron, stamps, and more… You will have time to explore a variety of effects to create a mixed media art project. Bring your favorite art materials to try on lutradur, as well as any photos, beads, etc. for your personal project. Bring your sewing machine if you want to use it to sew your project. Saturday January 23rd – noon to 3:30 p.m.
Pre-registration required. Please call New Pieces at (510) 527-6779 to pre-register, or if you have questions, please email me at HeidiRand@gmail.com or call 510.919-4652. Sunday February 21, 2010, noon to 4. Inkjet heat transfer techniques. El Cerrito Canyon Trail Art Center. Saturday, March 6, 2010, noon to 4. Inkjet printing on fabric. New Pieces Quilt Store, Berkeley.